This manual page documents an old version of the plugin. See this page for other versions of the manual. 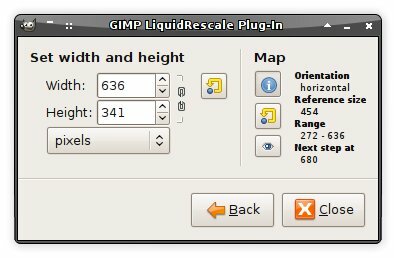 The Liquid Rescale plugin is an implementation of the content-aware resizing by seam carving algorithm by Shai Avidan and Ariel Shamir. 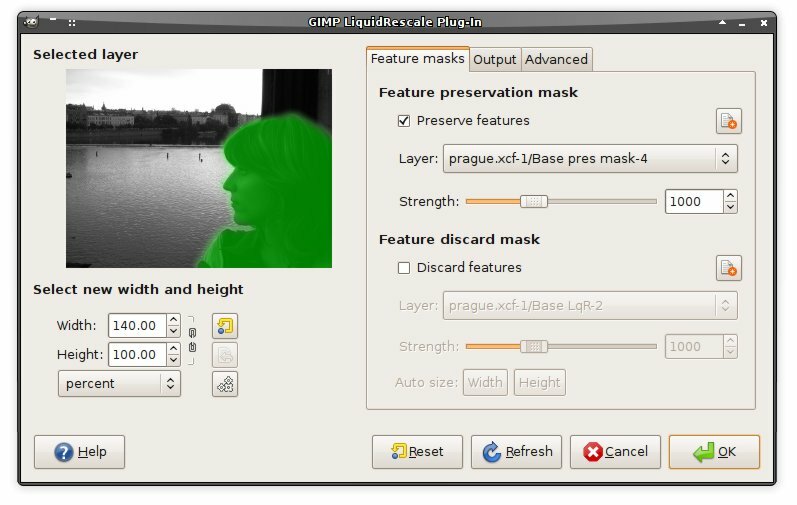 It works both ways (enlarging is performed in successive steps), and it can use extra layers as masks to select which features of the image should be preserved and which should be discarded. The plugin works on the active layer or floating selection. It can also operate on multiple layers through the "Filter all layers" plugin and using the GIMP Animation Package facilities for video editing. The three small buttons on the right can be used to reset the size parameters to the image size (top) or set them to the last used values (middle), or to switch to the interactive mode (bottom - see the corresponding section for more details). 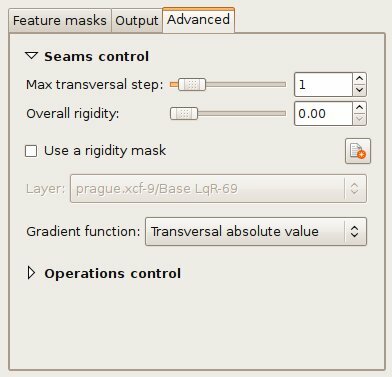 Press the "New" button in the "Feature preservation mask" section (this will create a transparent layer, with 50% opacity, and pick an appropriate colour). In the "Feature preservation mask" section it is possible to specify if there are regions of the image which should be preserved from modification, by checking the "Activate feature preservation" box, and by choosing a layer among the ones which belong to the current image (excluding the active one) in the "Available layers" menu. The "New" button creates a transparent layer with 50% opacity and an appropriate name, and sets it as the selected layer mask (note that this fails if the plugin is invoked on a floating selection, because GIMP does not allow to work on other layers in such case). It also sets the foreground colour to green; the previous colour is restored when the dialog is closed. The Feature discard selection section is nearly identical to the previous one, but the effect is reversed, and the default colour for the "New" button is red instead of green. Output on a new layer. Specifies if the resized image should be written on a new layer. By default, it is off. Output the seams on a new layer. Specifies whether to create a new layer with the seams map in interactive mode. The two buttons on the right of it let the user choose the seams colour range. The seams are computed on the original layer as far as they are needed for the new size (e.g. there will be 100 seams if reducing or enlarging by 100 pixels), the remaining areas are transparent. 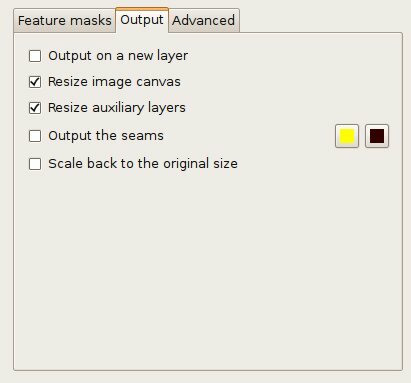 In order to read the result, use this option together with "Output on a new layer", and overlay the seams map to the original layer. If you rescale in two directions at once, you will obtain two maps, but the second one will be computed over an invisible intermediate image, so this is not very useful. The same applies in the case you choose to rescale back to the original size with LqR, or when the resizing goes beyond the limit set with "Max enlargment per step". Note that this option is ignored in interactive mode, except for the colours you choose, which are used when dumping the seam maps manually. 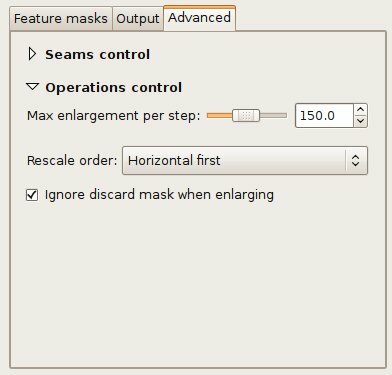 Use a rigidity mask. It is possible to specify different rigidity values for different areas of the image, using an auxiliary layer, by following the same procedure used to specify the feature masks (the default colour for newly created rigidity masks is blue). If a rigidity mask is specified, its value at each pixel (computed in the same way as for the feature masks) will be used as a rigidity coefficient, to be multiplied with the overall one. Note #1: transparent (or black) areas in the rigidity mask always correspond to 0 rigidity, no matter what the overall value is. Note #2: rigid areas have a slight repulsive effect on seams, similar to that of a preservation mask. In order to compensate for this, you may use a discard mask. By default, the plugin is tries to find the seams which cross the lowest-contrast areas (how this happens exactly is specified by the gradient function choice in the "Advanced" tab). Therefore, each pixel of the image is assigned a so-called "energy value": the higher the contrast, the higher the energy, and seams are less likely to cross high-energy areas. Since in many cases this simple contrast-based method is not optimal, the energy function can be "biased" by the user, who can decide that some areas should have a higher energy (using a preservation masks) or, on the contrary, that they should have a lower energy (using a discard mask), and therefore effectivily "drive" the seams and the whole process.